When we first got chickens five years ago, the aim was to convert slugs and weeds into eggs. Of course, for a chicken to make an egg it needs calcium, protein, water and various minerals and the easiest way to provide all these things is to feed your hens commercial layer pellets. Because our hens free-range and have access to a variety of habitats, they forage quite a bit of their own food, but they still need some supplementary feeding. In a small garden there is a limit to the amount of chicken feed you can grow, so this is a compromise that we have had to accept. We give them any slugs and snails we come across when we are working in parts of the garden they do not have access to and I give them weeds that I have removed – docks from the fruit cage are a particular favourite at the moment. But, even so, they get through more organic layer pellets than I would like. Indeed, since they have done such a good job of reducing the mollusc population, they are getting less food from this source. A couple of winters back we had very cold weather (for here) and boosted the hen’s diet with mealworms, which you can buy live or dried and which are sold as wild bird food. The hens LOVE these, but they are rather expensive. I, therefore, decided that the time had come to try to produce my own. 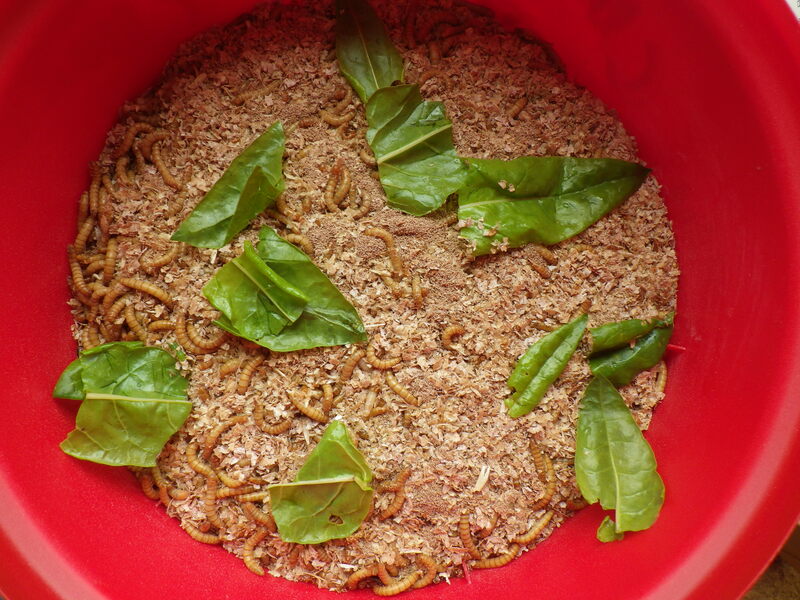 Mealworms are the larvae of flour beetles and can be raised on bran or oats (no need for rotting corpses as you need for maggots) so they seem like a good source of protein to produce for use as chicken feed when space is limited. 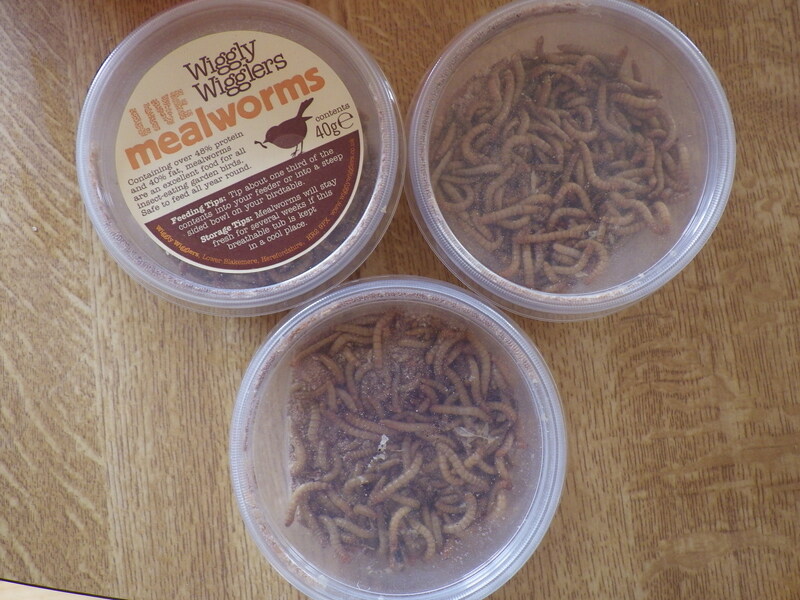 I’m not particularly bothered by insect larvae, so over the weekend I bit the bullet and ordered a mealworm starter pack, so that I can grow my own! A bit of reading around revealed that they like something a bit more chunky to get their mandibles into, so later I added some satsuma pieces. The fresh food provides them with their only source of water, so it’s important to make sure they have it. Apparently they will pupate in t”a few weeks” at which point I will need to transfer them into another container without bran before moving the adults into a third container when they’ve emerged. At this point they will mate, lay eggs and die and I will them wait for more mealworms to hatch. In theory I will get increasing numbers and thus food for hens. Our local mill has an excess or bran, so that’s not a problem as regards feeding and I can give then vegetable peelings/waste as their water source. So, I’m hoping that this is a pretty sustainable, environmentally sound method of producing some chicken feed. It won’t replace the layer pellets, but it will reduce the need for them a bit. I’m still slightly surprised at myself! Ewwwww! But also, super interesting. You can even send Mr SoH out fishing now with home grown bait. Now, that’s a great idea! Mealworms are supposed to be very nutritious and have been mooted as a possible human food source for the future (apparently the next generation will be eating insects for reliable, sustainable protein…). Certainly when I was involved in bird rescue work mealworms proved irresistible to my feathered chargers, though I never tried them myself. Perhaps chocolate-dipped? I wondered about deep-fried as a crunchy snack? Hens are the perfect way to convert slugs (yuk) into something edible and, indeed, delicious. You could always bypass the hens entirely and throw a handful into the stirfry! I hope you’re going to post images of the girls fighting over a worm; nothing to beat a tug of war for entertainment value! I’m hoping there will be plenty to go round in order to minimise squabbles! It’s going to be interesting to see how much the population bulks up and whether we can produce a significant number to feed to the hens. just got to this now. They don’t say much, do they? !